Victory Gardens Theater and Teatro Vista’s co-production of Fade, by Tanya Saracho, directed by Sandra Marquez is a compelling journey through class, race, and ambition. Marquez’s finely tuned direction enriches Saracho’s nuanced approach to the heightened and complicated world of power that these characters navigate. Fade is the story of Abel and Lucia, and of the relationship that develops between them. Mexican-born Lucia has just arrived into the bewildering and disheartening world of television writing in Los Angeles. She is a novelist with no TV writing experience, and homesick for Chicago, exhausted by the unrelenting misogyny and racism of her new work environment, she finds herself staying late at the office in a city where she has no one to turn to. U.S.-born Abel, who is also Mexican, works as a custodian for the building; he is from El Sereno (northeast L.A.), an ex-Marine, a previously incarcerated single parent, and is just trying to do his job. The friendship that grows between them starts off rocky: Lucia makes several assumptions based on their shared Mexican-ness, which definitely rubs Abel the wrong way. Desperate for someone to be on her side, at least, if she can’t have a friend, she makes amends and continues to reach out to Abel. Abel, who is slow to trust, eventually warms up to her, and bit-by-bit they become friends. He listens to her vent her pain and frustration, and she acknowledges his presence, his humanity, and when she has earned his trust, she listens to his problems and history. As Lucia meets with growing success in her new job their relationship begins to change, until one fateful evening Abel learns that Lucia has broken his trust and taken advantage of his openness to further her career. By the end of the play, they have drifted apart: Lucia to her new and glamorous success, and Abel to his hard-working, thankless nights. 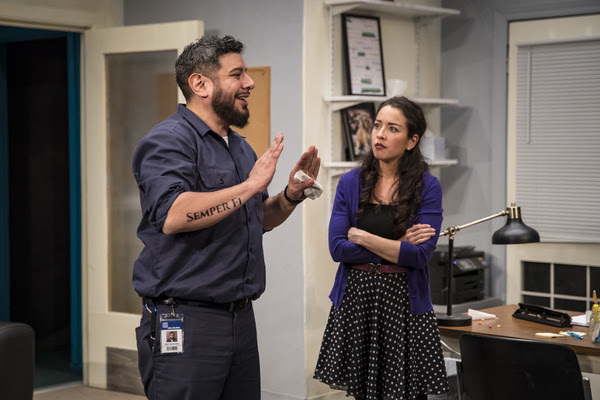 Marquez’s direction sharply tackles the layers of experience that deepen each of the scenes in the play, and unabashed, leans into the questions that Lucia and Abel’s relationship raises. At the same time, Marquez creates a balance between the parts of the text that seem, frankly, for white people with the parts that are for Latinx people, specifically Mexican and Mexican-American people. While Lucia’s lines at times felt expository and didactic, and aimed at helping audience members understand the source of her outrage, the combined talents of Sari Sanchez (Lucia) and Sandra Marquez locate it in a place that many people of color are familiar with: a place of naming, codifying, and metabolizing. For those who face racism and race-based misogyny on a regular basis, daily life in the U.S. is often a constant struggle with cognitive dissonance and a lifelong effort to resist wide-spread racial and gender-based gas-lighting (a form of emotional abuse and manipulation aimed at destabilizing and delegitimizing a person’s experiences and beliefs). Marquez’s expert hand, and Sanchez’s considerable talent guide these moments to a flexible and recognizable place. Likewise with Eddie Martinez’s portrayal of Abel, what might have been stereotype is built up to be a genuinely moving and complicated performance. Martinez delivers a man whose slow thaw is wonderful to see, and whose final betrayal by Lucia is heart wrenching. Together, Sanchez and Martinez are delightful to watch; whether arguing about fresa-activism, spilling (and cleaning) corn nuts, punch dots or snacks, or honestly opening up to each other, they are as engaging as they are talented. Saracho’s text presents a challenge, one that Latinx playwrights often face, of juggling cultural context, emotional authenticity, and accessibility to white audiences. What Saracho does beautifully is cultivate the universal in the specific. By faithfully recreating a world in which these characters must consistently confront the simultaneous erasure and hyper-visibility of their racial and ethnic identities, Fade offers a compelling look at the choices that such pressure engenders. For Lucia, who is light skinned, college-educated, and from a privileged family, survival and racial pressure looks much different than it does for Abel. Abel, whose ex-marine background is representative of one of the limited avenues to prosperity and education available to many working class brown East-Angelenos, is darker skinned than Lucia. Add on to that his previous incarceration, and his struggles as a single parent, and a very different picture of latinidad emerges. While Abel and Lucia share a racialized identity, courtesy of white supremacy, as well as certain cultural touch points, their experiences vary greatly. Marquez invests wholeheartedly into exploring this tension through Abel and Lucia’s relationship, and encourages the audience to do the same. Set design by Regina Garcia, and lighting by Jesse Klug, are every bit the treacherous and isolating fluorescence of a angular office building, yet provides an open and airy look into this relationship. Klug’s lighting is sensitive and attentive, and harsh and unforgiving when it needs to be. Mealah Heidenreich (Properties) and Christine Pascual (Costumes) provide a smooth and subtle material arc to complement and physically articulate the emotional one. Additionally, it was a joy to see Garcia and Heidenreich communicate the hilarity and comedy that bubbles in this play through the jokes that the set tells. Sound by Victorio Delorio is executed with reserve and poise, whether it be badly-written T.V., beautiful transition music, or the sound of a vacuum. Fade raises questions about ambition, loyalty, class and power. Marquez and Saracho don’t offer any easy answers, but certainly offer the rare chance to embrace that sometimes-painful complexity. Bias alert: Lucas works with ALTA, which was co-founded by Tanya Saracho and Ricardo Gutierrez, Artistic Director of Teatro Vista.